Baseball Fence Topper is here to help protect your players and guests from injury while staying in budget. Exposed chain link poses a safety problem at many modern recreation and sporting facilities. When installed, the top edge of a chain link fence is often jagged and sharp, creating a potential hazard to athletes, spectators, and visitors. 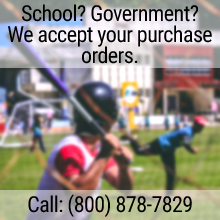 While some commercial chain link is "knuckled" or folded down at the edges, we believe that this alone does not offer adequate safety for many athletes, such as baseball and softball outfielders running for a fly ball. One way to help improve safety is with one of Signature's chain link Fence Topper options. We carry a complete line of fence guards to meet your varying budget and needs. Choose Fence Topper extruded sections or our PolyTube corrugated pipe to increase the safety of your facility.